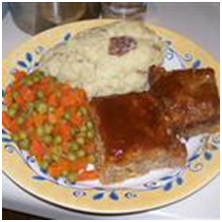 A spicy mix of ground turkey, chicken, and pork sausage makes for a great tasting meatloaf. Cover the meatloaf with cooked bacon slices before glazing if you like a smokier flavor. 1.Preheat oven to 350 degrees F (175 degrees C). Grease a 9x9 inch baking pan. 2.Combine the turkey, chicken, sausage, and egg in a large bowl. Stir in the saltine crackers, 1/2 cup barbeque sauce, 1 tablespoon of mustard, liquid smoke, parsley, dried onion, onion powder, garlic salt, and seasoned salt; mix well. Press into the prepared pan. 3.Bake meatloaf in preheated oven for 25 minutes. Combine the brown sugar with the remaining 2 tablespoons of barbeque sauce, and 1 tablespoon of mustard to make a glaze. Remove meatloaf from oven; brush with glaze. Return the meatloaf to the oven, and bake until no longer pink in the center, about 25 additional minutes. An instant-read thermometer inserted into the center should read at least 165 degrees F (75 degrees C).